acuro manufactures a wide range of food grade ro antiscalants that prevent deposition of various organic and metallic scales on ro membranes. 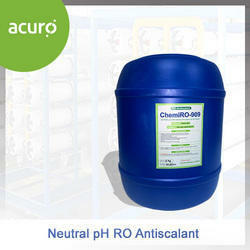 acuro's range of ro antiscalant is certified as suitable for drinking water and food processing applications as per ansi/nsf60 by nsf, usa. · decreases frequent shutdowns, periodical cleaning and servicing of the system. · reduces extra energy, manpower, expenses and forcefully untimely-allotted time.
. the material will be work up to 5000 tds and 50-100 silica (regular grade). 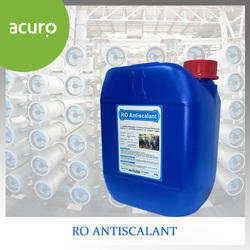 for maximum effectiveness, ro antiscalant should be added prior to static mixer or cartridge filter housing. typical dosage range is between 3 and 6 mg/l more precisely it is 3 to 5 mg/l. 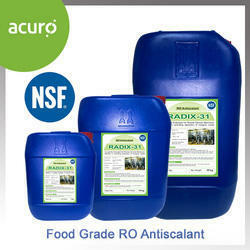 radix 31 is a nsf certified, food grade ro antiscalant. 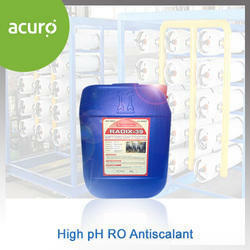 radix 39 is a high ph ro antiscalant. acuro offers a complete range of ro antiscalant chemicals, which prevent deposition of inorganic salts and biofouling on the reverse osmosis membranes. this enhances performance of the ro system and eliminates frequent shutdowns and reduces cost of maintenance of the system. 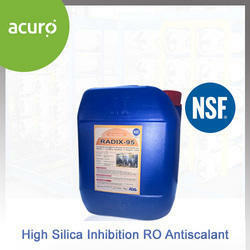 radix 95 is a nsf certified, food grade ro antiscalant with high silica inhibition properties. it has multi-component formulations that allow higher ro system recovery rates and reduce cleaning frequency. it inhibits scale while dispersing colloidal particles. the inhibition and dispersant properties of radix 95 helps to extend system run times, reduce cleaning frequency and increase the productive life of ro elements. 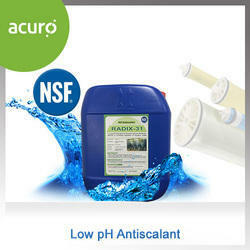 acuro manufactures a special antiscalant which is of neutral ph for specific industrial applications. 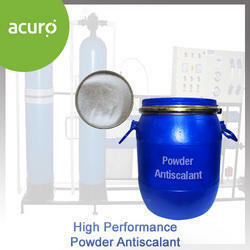 acuro delivers high performance powdered antiscalant for high silica inhibition. it is well-suited for all type membranes, enhances the membrane's life thereby reducing the maintenance cost. 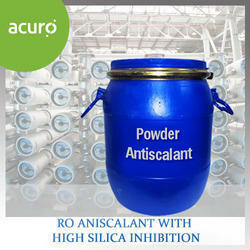 high strength, surfactant based powder formulation for on-site preparawith high silica inhibition. 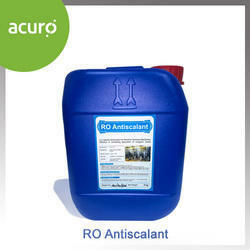 Antiscalant balls are pretreatment products formulated to prevent (rather than remove) scaling and inorganic fouling. a preventative system maintenance program with the antiscalant balls reduces membrane cleaning requirements while enhancing your ro system performance. most natural waters cause damages in ro membranes, pipes, boilers and other installations. some contain dissolved minerals, mainly calcium and magnesium salts. such waters are referred to as hard water. hard waters form scale in membranes, pipes and boilers. this leads to a decrease in water pressure and an increased energy demand. clogged pipes may have to be replaced. heating coils may overheat and fail. hard waters are aggressive to metals and cause corrosion. consequently the tap water turns brown. leaks and burst pipes may be the results. protect water systems in hotels, public buildings, private households and industry against scale formation and corrosion. save expensive repairs or even replacement of water pipes, boilers, heaters, cooling systems etc. extend the life of your water installation. acuro antiscalant ball prevents scale and stops corrosion. it utilizes the phenomenon that minute concentrations of polyphosphates are sufficient to inhibit the deposition of scale onto metallic surfaces. because of their phosphate and silicate content, acuro antiscalant balls also inhibits corrosion by forming a thin protective layer on the metal surface. a concentration of 2-3 ppm is sufficient to achieve both of these effects. acuro antiscalant balls will also slowly remove existing scale in old pipes if it consists of brown scale, i.e. ironoxide. hard scale, i.e. calcium carbonate cannot so easily be removed by acuro antiscalant balls. here the advantage is again that acuro antiscalant balls will prevent further scaling up. experience shows that scale and corrosion is not only found in galvanized but also in copper pipes. even in plastic pipes one can find scale and deposits. as a rule of thumb one can say that 1 mm scale on the heating coils of a boiler, increases the energy cost by 15%. 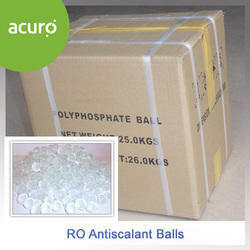 acuro's antiscalant balls consists of 100% active substance. the use in tap water and other types of fresh water at the prescribed dosage is inoffensive. acuro antiscalant balls dispensers can be installed in almost every water system. they require no electric installation and hardly any maintenance. they only have to be refilled with spheres every 3 - 6 months. refilling is very easy. it ensures long life of membranes.